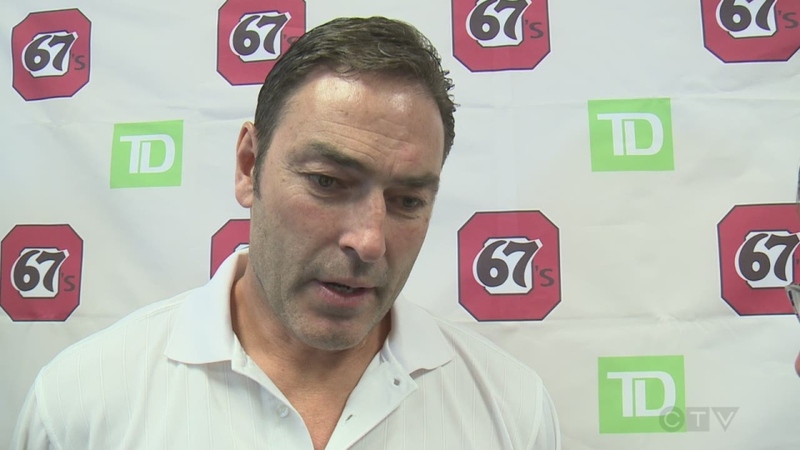 Ottawa 67's head coach Jeff Brown "crossed a line" when he grabbed a player on the bench in a Sept. 30 game, team owner and president Jeff Hunt said Tuesday. Representatives of the Ontario Hockey League were in Ottawa Tuesday to interview 67's players about the situation, the Ottawa Sports and Entertainment Group confirmed. Hunt said the game, which the 67's lost 7-4 to the Sarnia Sting, was getting out of hand and the Ottawa bench was coming close to taking a penalty. In order to get control of the situation, Brown grabbed a player by the back of the jersey. "You can't put a hand on a player," says Hunt. "Not in this league, not in any league and Jeff knows that, he's aware that he crossed the line." Brown hasn't been disciplined by the team. He has apologized to the player and Hunt said both he and Brown have spoken with the player's family. Brown wasn't behind the bench for the 67's game last Thursday, but was back coaching on the weekend. He was absent from practice Tuesday, and OSEG said he would not be commenting. In a statement, OHL commissioner David Branch said the OHL "takes our commitment to our players and their player experience very seriously. "As part of this, when we hear of comments that concern us we have a duty to quickly get a better understanding and more information about what is being said," he said in the statement. " Currently we are in the process of talking to some of our players and others in Ottawa. In the event we have something to report out of this, we will. Until then, we will continue to gather information”.